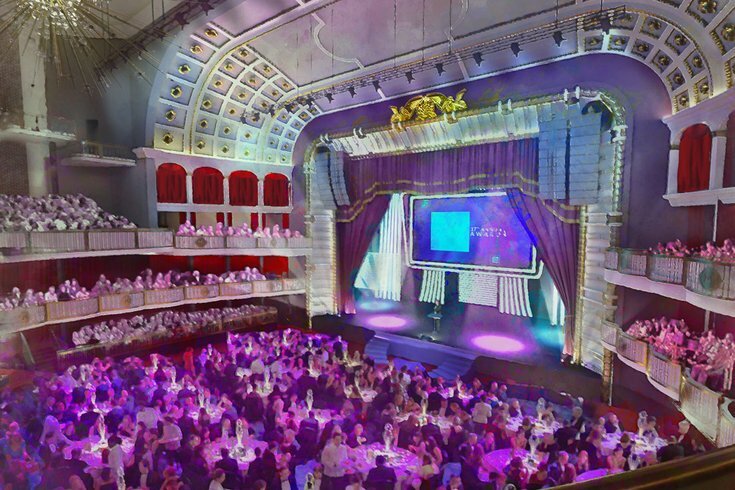 A rendering of the Met set up for a cabaret or awards show. Bob Dylan, Weezer, John Oliver, Jim Gaffigan, Lindsey Stirling, Kurt Vile, Amos Lee – and the names of headliners go on and on as Live Nation revealed the inaugural Citi concert series for the soon-to-be The Met Philadelphia coming this winter. Live Nation representatives, project developers and city officials revealed the exciting lineup during an announcement at the neighboring Divine Lorraine Hotel earlier today. 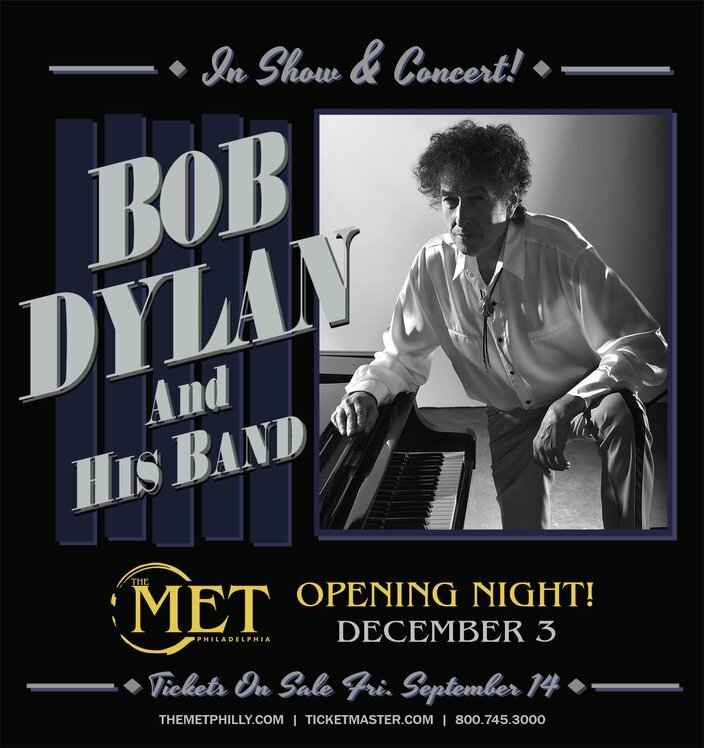 Dylan will give his 50th Philadelphia-area performance when he opens The Met on Dec. 3. Weezer, who recently reached number one on the alternative rock charts with a remake of Toto’s “Africa,” will follow, with a concert on Dec. 12. Two days later, Ween will take the stage, followed by PnB Rock on Dec. 28, and Kurt Vile and the Violators on Dec. 29. Housed in the footprint of the newly restored Philadelphia Opera House at Broad and Poplar streets, The Met promises to bring a broad-based, awe-inspiring and multi-talented lineup of entertainers to a diverse Philadelphia audience. The restoration of the Oscar Hammerstein-designed 1908 opera house cost a total of $56 million, split between Live Nation and developer Eric Blumenfeld, of EB Realty Management Corp.
Eleven-time Grammy nominee and NAACP Image Award winner Charlie Wilson will headline the WDAS Holiday Jam on Dec. 22, and Oliver, host of HBO’s “Last Week Tonight with John Oliver,” will be the first comedian to appear at the historic venue on Dec. 30, and for a special New Year’s Eve show on Dec. 31 to close out 2018. “We are thrilled to offer an electric series of opening shows that will truly offer something for everyone at The Met,” said Live Nation Philadelphia Regional President Geoff Gordon. Mayor Jim Kenney was also in attendance today and said he looked forward to seeing the revamp of the old opera house in the coming weeks. "Philadelphia is already known as a place that has excellent live music venues, but we now have another great one to enhance our city's vibrant arts and culture scene. The Met will help continue the revitalization of North Broad while allowing local residents to see world-class performers in their own neighborhood," he said. Tickets will go on sale to the public this Friday at 10 a.m. Live Nation has vowed to donate 25 cents of every ticket sold to a show at The Met to Philadelphia public schools.